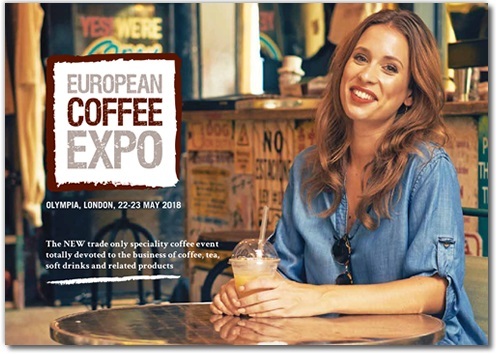 LONDON, UK – Taking place from May 22nd – 23rd, 2018, at London’s Olympia, European Coffee Expo is the result of months of consultation with key buyers and suppliers, including an industry-wide survey. It is an exhibition, together with a star-studded conference and demonstration programme, launching at the request of buyers and sellers alike. European Coffee Expo works alongside a steering panel of top buyers recruited from all the major industry sectors. They continue to help us shape the event ensuring it delivers for both exhibitors and visitors. The show targets the whole ecosphere of buyers, sellers and intermediaries. In addition to the artisan coffee and café sectors, thousands of major corporate buyers will be visiting from restaurants, pubs, hotels, fast food outlets, casual dining, contract caterers, retail, leisure, travel, forecourts, supermarkets, health and education and work spaces to name but a few. It is a COFFEE show and not a café show! The overarching aim is to improve coffee and beverage customer service, increase sales and profitability.